The Last Dinosaur: Hunting T. rex in the Badlands of North Dakota. All 2016 Field Season dates are up! Day tours, half and full weeks on sale. Hell Creek Fossils LLC is working on putting together a continued education certificate program for educators. No prior knowledge would be necessary. Anyone in the program would participate in the dinosaur dig charter same as regular participants. There will be discussions and guest lectures in the evenings. As part of the program, teachers would be able to expand their knowledge of paleontology, dinosaurs, and earth science. In order to start the program we have to show interest level is high enough. If anyone would be interested in participating in this program, please let us know and share this with others. Doug Hanks presented at the Minnesota Discovery Center on February 13, 2016. Minnesota dinosaur is the talk of the show!!!! Doug Hanks of Hell Creek Fossils presenting at the 2016 GSA North-Central Section meeting! 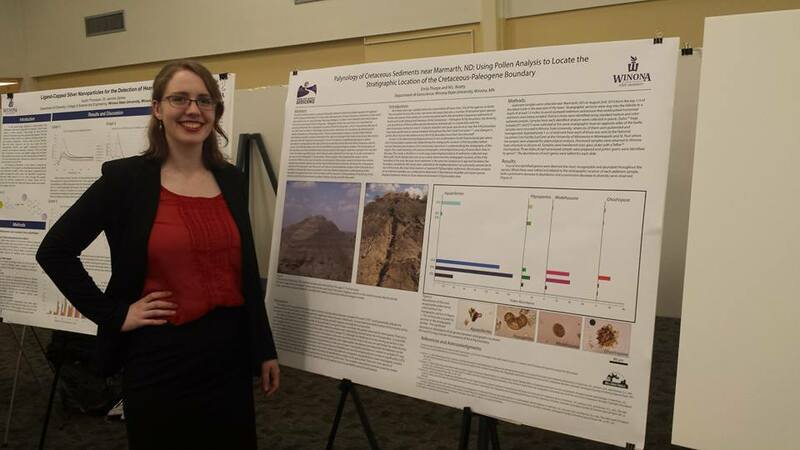 Winona State University student Emily Thorpe presents her research project on fossil pollen from North Dakota. Samples were collected while participating in the Hell Creek Fossils dig as part of a student research group lead by Dr. William Beatty. Great job on your project Emily! Summer 2012 - Excavating a hadrosaur skeleton. The skeleton was found in the 66 million year old Hell Creek Formation, just below the Cretaceous-Paleogene boundary that marks the extinction of the dinosaurs.